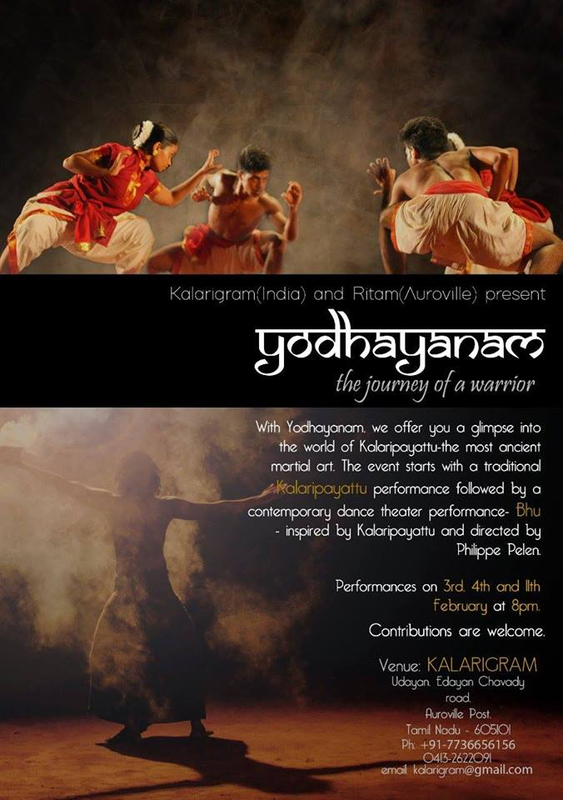 KALARIPAYATTU performance along with a contemporary theatrical performance: BHU, inspired by Kalaripayattu, directed by Philippe Pelen. An event so profound in this age of hostility is hard to come across, an evening of wonder for people of all ethnicities to feel a connection with nature and lead their life in a self aware, peaceful and blissful way. A traditional performance of the world's most ancient martial art: KALARIPAYATTU, it offers a glimpse at the rigorous training a warrior undergoes in his journey to discover a deep union with himself and nature. The Kalaripayattu performance is then complemented with a contemporary dance theater performance BHU which is inspired by Kalaripayattu, in a newly built amphitheater which will be inaugurated on Sunday the 14th of January at 6pm. Bhu offers an interactive performance combining theatre, dance, traditional and contemporary music and Kalaripayattu. The process is led by Philippe Pelen Baldini and Thierry Moucazambo, and guided by master of Kalaripayattu: Sri Lakshman Gurukkal. This is the story of a man who in his quest to become a great fighter comes to Kalaripayattu master, but instead the master teaches him how to fight his demons, his fears, his ego. He learns to dance with the five elements: earth, water, fire, air and ether. Will he let his 'body become all eyes', always in union with mother earth?